love? I say love, do you hear me? calling out the oldest question. This poem appears in The Wild Weathers: a gathering of love poems (Leaf Press, 2012). Judith Heron lives in Victoria on Vancouver Island, British Columbia. Though full of prairie blood, she has always lived on the west coast. Since semi-retiring from a family counseling practice, other poets have inspired her to take her writing more seriously. 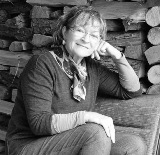 Judith’s work has been published in a number of retreat chapbooks edited by Patrick Lane, and in two anthologies: The Murder of Crones (Ptarmigan Press, 2007) and The Wild Weathers: a gathering of love poems (Leaf Press, 2012). She is currently working on her first book-length manuscript. Suggestive and longing. Unrequited love? Belated informing of love not spoken at the presence of one's lover. This is what I am reading, I think. What lovely words to read as the sun sets on a frothy ocean here in Mexico. Nice one, Judith! Judith .... your poem speaks at a deep emotional level to every soul that inhabits this earth. Your description even speaks to a guy like me! Hurrah, Judith! Such a wonderful flow to this poem and that blast of red at the end--brilliant! I love what Judith says in this poem - the " yes" of it - but also love how she crafted it. The beautul use of short line and she's really mastered the line breaks. Great job, Judith! More, please. Love the subject and images, just ordered the book; thanks, Judith. Yes is like an arm full of ripe tomatoes, I've always thought. Hooray for you, Judith. Oh, yes! I love how this woman opened herself to what she thought and saw and what she imagines can be! Brave poem. Good poem! Makes me think of Molly Bloom. 'like ripe tomatoes' -- wonderful ending to a lovely poem. very, very nice. my arms full of yes! Yes! Yes! Great image of ripe tomatoes, Judith!